BIG MOVIE FREAK: The Hobbit director CONFIRMED! 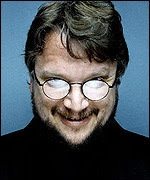 Guillermo Del Toro, director of Cronos, Mimic, The Devil's Backbone, Blade 2, Hellboy 1 & 2 and Pan's Labyrinth will helm the two-parter prequels to Lord of the Rings! TheOneRing.Net was the first to break the news (link here). Apart from the physical resemblance to LOTR director Peter Jackson pre-diet phase, Del Toro is more arthouse than a Spielberg like Jackson. His knack for putting interesting visuals and themes onscreen (and his love for creatures and assorted monstrosities sure helps) usually more than covers for his shortcomings in pacing and editing (exception: Blade 2). I still think Jackson is the better choice for keeping the Middle Earth universe consistent with the trilogy, which is what people loved in the first place. But since it's going to be Del Toro, I hope he's given free reign to do his own interpretation, and not try to ape Jackson, who was already kind of aping Spielberg. Bryan Singer, the very talented director who made two really good X-men movies, tried to ape Richard Donner, and came up with the disappointing Superman Returns (which could have used a little more of his X-men sensibilities in it). I really hope The Hobbit isn't going to be Del Toro's Superman Returns.